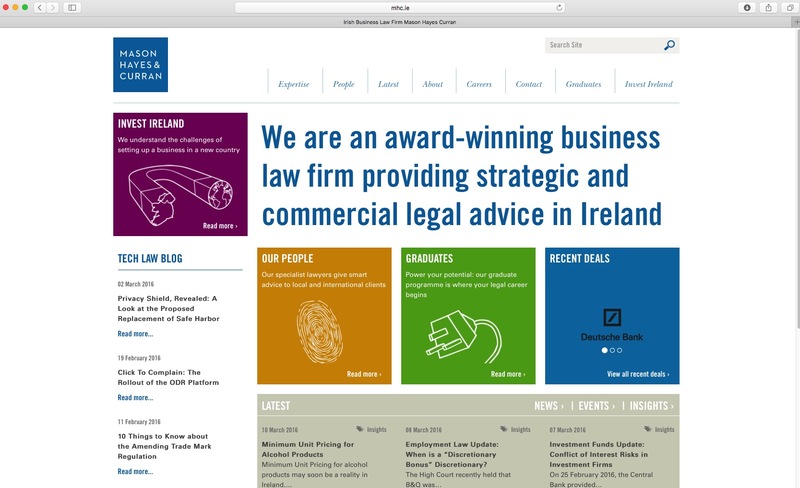 Mason Hayes & Curran is an award-winning business law firm with 73 partners and offices in Dublin, New York and London. Communicraft created a bespoke website powered by the Expression Engine content management system to create a digital presence worthy of a firm that lists Liberty Insurance, Storyful and IFG among their clients and represents multinational businesses such as Facebook, Twitter and LinkedIn. Such a large and busy organisation has a big story to tell, and strong information design was required not only to organise & position the content, but also to allow visitors of the site numerous routes to the content they required, depending on their own perspective. Communicraft successfully imported a huge volume of content from an earlier version of the MHC website, reorganized into an intuitive new information structure. The site also allows users to register for events and to subscribe to their popular insights, e-zines and tech law blog. I've worked with many technology teams over the past twenty years. Few compare in terms of quality and technical ability with the Communicraft team. They bring a deep technical mastery and a clear customer focus to their work and I'd have no hesitation in recommending them for application development. Communicraft now Recruiting Senior .NET Web Developer in Dublin.